Although the majority of hair transplant procedures are done in men for androgenic baldness, hair transplant is also done quite commonly in women. In Downtown Hair transplant clinic, about 5% of patients are females. There are mainly three conditions in which females require hair transplant � Female pattern baldness, lowering of hairline and eyebrow reshaping. Medicines: Medicines are given in females and have a good efficacy. The main medicine that is proven to be effective is Minoxidil. Minoxidil has some disadvantages � it does not work in every case, it has different grades of effectiveness in different persons and it works only for the period it is applied, if it is stopped hair loss again returns to the previous level. It is otherwise very safe but is very toxic for the fetus and absolutely contraindicated in pregnant women and those who are planning for pregnancy. LLLT �Low level Laser Therapy can also be quite effective in those who are suffering from increased hair loss. It can minimize progress of baldness. However it will not return hair which is already dead and hence cannot reverse baldness but may help in preventing its progress. Look up here for more information on LLLT. SMP �Scalp micropigmentation is another very effective treatment specially for women. In this method small microdots are placed close together in the bald areas of the scalp so that they appear like hair and bald areas are covered up. It can be very effective in hiding the bald areas. Look up here for more information on SMP. Hair transplant:Hair transplant is the gold standard for treatment of baldness as it gives natural hair which lasts throughout life and returns the scalp to its normal hair growing state. The type of baldness that occurs in females is called female pattern baldness. It is quite different from that of male pattern baldness. In women, baldness has a much lower incidence than in males. And secondly, the pattern of hair loss is completely different. In males, there is a typical shape of the hair loss, with the hair receding primarily in the temple area, or the crown, or both. In females however the hair loss is diffuse, with the hair reducing uniformly all over the scalp. More or less the entire scalp is affected. Hair transplantation in women is thus different from males. In females, the extraction of the hair, the first part of the procedure, is the same. It is done through FUT (strip method) or FUE just as in males. But there is difference in planting. In males the hair transplant surgeon is concerned primarily with creating a hairline and then increasing the density progressively behind it. In females, the concern is primarily with increasing the density of hair. While doing this, the surgeon is careful to see that the front portions of the scalp are given more hair as this is after all the portion that is most visible. There are some technical differences � females naturally will not allow any trimming of hair and so the new hair follicles have to implanted between existing long hair which can often be a challenge and is more time consuming. 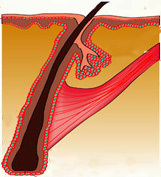 Also as a larger area of the scalp is to be covered by hair, more local anesthetics have to be given. The angle of the hair to the skin is also different in females. But overall, hair transplantation is very effective for female baldness also and is satisfying and fruitful for the patient. This is also something that is often asked for by women coming to the Downtown Hair Transplant Clinic. Many women feel they have too high a hairline and their forehead appears too big when their hair is pulled back. They are thus unable to use some hairstyles. Hair transplant is a very effective solution for this. A new hairline lower down as per the patient�s wishes can be created as is done in male pattern baldness. The female hairline is shaped differently than the male and is more rounded, this of course has to be followed. Once this difference is kept in mind, an excellent new hairline can be created for the patient at a lower level. This is the third common requirement for females. Often the eyebrows can be very thin and unsatisfying � this may occur due to overplucking, use of bad quality eyeliners, genetically from birth, with age, due to trauma, due to conditions like hypothyroidism, etc. Hair transplant can be used to solve this problem also. Hair transplant from the scalp itself is used but here, temporal hair, ie, hair from the region above the ears, is used as it is of the same texture. The hair is then planted with very high density into the eyebrow area and the eyebrow is shaped. Since the hair is from the scalp, it will continue to grow long and the hair has to be trimmed regularly about once every 7-10 days. But usually in about two years, growth will be the same as other eyebrow hairs and trimming is not required. About 200 hairs are used for each eyebrow generally. Besides these three main requirements for female hair transplant, there can be other individual causes such as hair loss due to burns, Hansen�s disease, etc. Overall, hair transplantation is a very successful procedure for women also and can be a big boon for those whose hair loss has sapped their strength and confidence.